According to Gazeta Wyborcza the voivodeship (regional authorities) of Upper Silesia approved additional spending for Stadion Śląski. The already-hyperinflated price tag of PLN 650 million (currently $154m), almost twice the amount from 2012, will be increased by additional PLN 4 million (or $1 million). 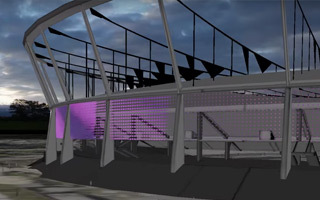 This spending would fund a LED mesh around the perimeter of the stadium, becoming its façade. Designed with monumental columns and rings of the roof, the stadium is currently a bare concrete and steel structure. Adding LED lights would make it more appealing. This way Śląski will not only light up at night become more vivid during events, it’s expected to generate additional revenue from advertising and potential naming rights deal. Adding the LED envelope was advised in January by consulting firm Evolutio who indicated several ways of increasing revenue. The 54,000-capacity stadium is still expected to run on a constant loss but its scale needs to be minimized. As Wyborcza claims, the LED façade may have one more advantage. The stadium’s real estate tax might fall significantly if it’s enclosed. As open space, majority of the stadium would be covered by the definition of ‘structure’ rather than ‘building’. Once it’s clad, even if only to a limited extent, it becomes a building. Structures are charged with 2% of their complete worth, while real estate tax of buildings depends on their surface. Gazeta Wyborcza claims the latter interpretation may mean up to PLN 4 million less in tax annually though that estimate seems overly simplistic. Chorzów city hall, on whose grounds regional authorities built their stadium, declare they will wait for the investor’s own estimate to give their real estate tax evaluation.